Change is universal and so it is applicable in agriculture too! “We are an agriculture based family. We have learnt farming from our ancestors and we follow them quite a lot but with time it is imperative to change. Being the next generation farmers, we brothers brought some major changes in our family run farm. We introduced integrated farming model with key focus on planting forest trees, livestock farming and growing multiple crops. Precisely by growing melia dubia trees there has been significant change in our financial status,” he adds. Kalpashri Farm spreads in 25 acre having rich plantation of fruit trees, forest trees and vegetables. All these are nurtured with inter-dependence on livestock farming. “Without knowing anything about melia dubia I had bought 40saplings along with 400 teak saplings for my farm. I was encouraged by the awareness program by BAIF (Bharatiya Agro Industrial Foundation) Samsthe, who were selling the tree saplings too. I bought melia dubia at Rs. 2/sapling,” he shares his first introduction to this forest tree. Mr. Murthy finds melia dubia low maintenance tree. It grows in any soil except alkaline soil. It is dry land tree that need very little water. Distance between two saplings must be 20 feet. It has to be pruned once in 6 – 12 months. The height of the plant is directly proportional to number of times the plant is pruned (approximately it attains 40 feet height). The leaves are good source of fodder for sheep and goat. The pruned branches are used as firewood. The green and brown litter of the trees makes good mulch for the soil. Tree starts gaining weight from 7-8 years onwards. Feeding the plant with manure certainly enhances the growth but even without it there is no hindrance. “We can give 10:26:26 (NPK). We have to water for the first summer after planting. Irrigation should be done once in 15-30 days. It must be ensured the soil doesn’t get dry and moisture level is maintained. 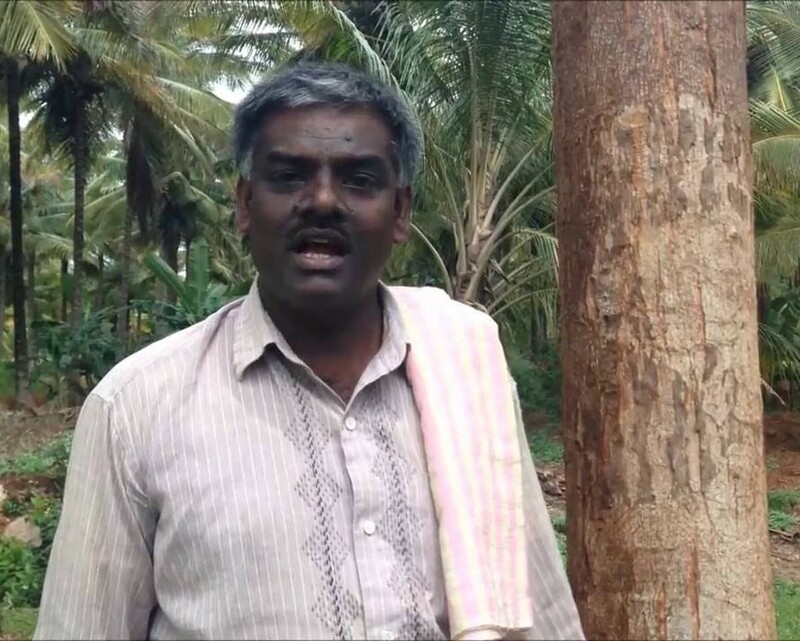 If intercrops are cultivated then no need to irrigate separately,” he explains. The girth of the tree should be minimum 3 feet for selling it to plywood factories. It is lucrative if farmer cuts and delivers the wood at the factories. “Plywood company came to my farm and gave the price of Rs. 2,000/ton. Enquiring further I was told if I cut and transport the wood then the price will be Rs. 6,300/ton. Thus we did it all on our own and got the fair price. The delivered wood weighed 40tons. After this we are convinced that to earn good profits in agriculture the farmer should become the seller to end consumer,” asserts Mr. Murthy. Mr. Murthy has his share of regrets too, “I feel bad that I bought 400teak saplings instead of melia dubia! It would have been Kuber. With teak plants we have to slog till it is ready for harvest that is approximately 30years. I feel sorry, that in my life span I cannot sell the teak trees,” he states. Mr. Murthy completed his ITI in engineering in 1994. He had job offers from Indian corporate companies but he declined it all to be a farmer just like his father and ancestors.